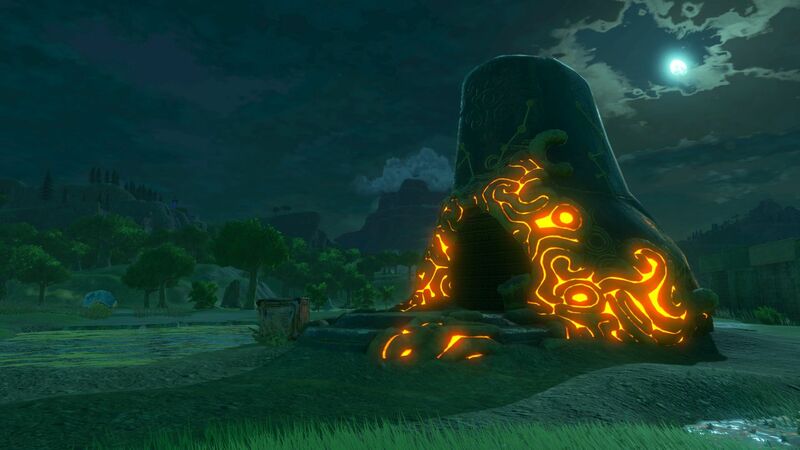 Breath of the Wild’s ornate lexicon yields its secrets. The Legend of Zelda: Breath of the Wild features a dramatic decorative language fans assume i yet another version of Hylian, the language of Hyrule. In most games this text would be nothing more than another pretty texture, but as with past Legend of Zelda games, Breath of the Wild’s text can be translated. With limited access to images and video of the demo on show at E3 2016, the community has already decoded it. Turns out it’s a pretty simple English substitution affair; the Zelda Wiki has a great image showing each letter and its associated Hylian rune clearly. Zelda Universe has collected together a few examples of the language at use in-game. My favourites are the word “dungeon” as a repeating motif on the wall of a dungeon, “now loading, do not turn off your…” on a mysterious piece of technology; and “goalpoint” over the – well. It’s nice to see the Zelda team maintains the warm humour Nintendo is famous for, even on such a big project under so much scrutiny. Turns out it’s quite a big team, and if E3 attendee reaction is any measure, efforts have paid off. The Legend of Zelda: Breath of the Wild releases in 2017 for both Wii U and NX, presumably sometime after Nintendo tells us what the latter is.